When preparing to compete at a swimming competition you need to pay careful attention to what you eat. Download the Laser Swimming Club Gala Nutrition info sheet to find out what to eat the day before the event and during the day. Good nutrition and regular hydration are essential to perform at your best. It can help delay fatigue, improve skill and concentration, and prevent injury and illness. A good diet will not turn an average athlete into a superstar, but a poor diet will prevent you from achieving your full potential. Download Laser Swimming Club Food for Sport document (prepared with kind permission of Irish Nutrition and Dietetic Institute). You can also review Áine O’Connell”s (BSc. Human Nutrition & Dietetics) presentation to Laser swimmers: Nutrition for Sport. 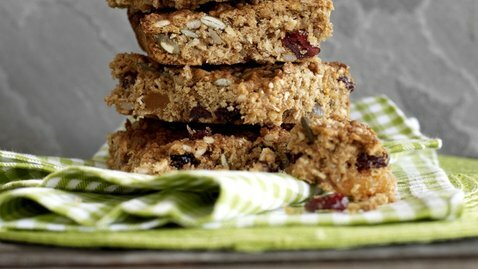 Muesli bars or flapjacks can be a great breakfast or energy bite for swimmers.Unfortunately most shop-bought versions are very high in sugar and saturated fats. This recipe has less sugar and more natural sweeteners like dried apricots, cranberries and ground cinnamon. Uses heart healthy fats from Flora, pumpkin seeds and sunflower seeds. Oat flakes, rich in B vitamins and cholesterol lowering fibre, make up the base of the bars. Whip up a batch of these super delicious and moreish muesli bars for a healthy treat to look forward to! Preheat the oven to 160°C. Grease a baking tray with a little Flora Butter. Line with enough parchment paper to hang over the sides. Grease the top of the paper too. Melt together the Flora Butter, sugar, honey and cinnamon and stir until the sugar dissolves. Mix this sticky mixture quickly into the dry ingredients. Press mixture firmly into the tray. Bake for 20 minutes until lightly golden. Lift out of the tray and allow to cool on a wire rack before cutting into squares.